The First French Empire was the empire of Napoleon Bonaparte of France and the dominant power in much of continental Europe at the beginning of the 19th century. On 18 May 1804, Napoleon was granted the title Emperor of the French by the French Sénat and was crowned on 2 December 1804, ending the period of the French Consulate and the French First Republic. NOTE: Territories with anchors near them show sea connections. Review by Nathan on 4/12/2017. Such a neat map. I love the external territories and the use of ships. Players should note that the anchors next to territories are what determine whether a sea connection exists - NOT whether a territory borders on a particular sea zone. Thank you! I will update the description. Review by Daryle on 4/24/2017. Review by LeBorgne on 5/12/2017. I especially like the graphic treatment of the ports, and how they make the sea zones important, despite their lack of bonus points. Good use of combining the regular border-based areas and the connected point areas. 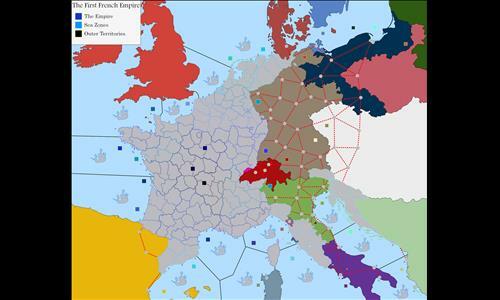 Playing this map makes me want to learn more about the fist French Empire. The Adriatic Sea area feels awkward, the Ilyrian Provinces really strung out, as they were historically.